Memory of Kindness is one of the latest fragrance releases from CB I Hate Perfume. It was inspired by a childhood memory of crawling under a tangle of tomato vines, and the notes are fresh tomato leaves, green tomato vines and garden earth. This is a must try for green fragrance lovers, especially those of you who adore the scent of tomato leaf. It captures their distinctive bitter-green herbal aroma perfectly. The fragrance is very sunny and bright, and to my nose has a distinct citrusy undertone although there are no citrus notes included. Add the smell of dirt warming in the sun, and you have the whole picture: the tomato garden in early summer. Simple, cheerful, and just right for this time of year. Memory of Kindness is available in perfume oil ($60 for 15 ml) or in a water-based spray formula ($60 for 100 ml). Off-topic: raise your hand if you are a resident of the United States and you haven't finished your taxes! I did my Federal taxes last month, but haven't even started on the State & Local. If you don't see a perfume review here tomorrow, it means I didn't get them done. Note: image is tomato [cropped] by Lawrence in Houston at flickr; some rights reserved. I WANT! =)… and thanks for pointing out that tomato leaf is in DKNY Woman, that must be the enticing note! Tomato leaf! Who woulda thunk it? I'm clearly out of the loop these days, as far as stuff they put into perfs goes ;D.
I really need to go try the DKNY again, I had forgotten about the tomato leaf, and I do love that smell. R, how different is it from the Yerbamate (which I like very much, but which is much more expensive)? Very different. MoK is much less sweet, and has none of the smoke or powder of the Yerbamate. A simpler scent, and for me at least, much more wearable — I admire Yerbamate greatly but it is rare that I can wear something with that much powder. Lovely review, R! 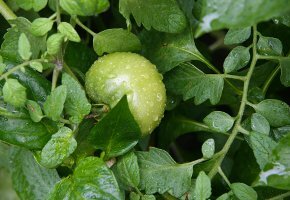 For me the smell of tomato(-leaf) brings back fond memories of the house, and particularly the garden, I used to live in. “Dirt warming in the sun” is such a beautiful association only a true lover of nature can have! Still, I'm not sure I'd actually wear something smelling of tomato seeing as the only tomato(-leaf)-based frag I tried, Lacoste's Essential, did nothing for me. Perhaps I just like eating them (tomatos, naturally :-)) rather than wearing them. Oh, well. Cheers! His story reminds me of my dog. Which, uh, sounds dumb, but my little dog loves creeping through my father's tomato plant jungle as well, and since he's only half a dog tall, sometimes we just lose him in there for a whole afternoon. This sounds just wonderful and fun. I love that dirty/clean smell of a big plot of tomatoes. Wonderful review, R, thanks. Thanks for adding Lacoste Essential to the list — I haven't smelled it yet & will have to do so. Sounds amazing, I will have to try it from Scent Systems in London. Eau de Campagne from Sisley has tomato leaf too, if I remember correctly. Another great fragrance I forgot, thanks B! Sounds lovely, I adore green fragrances. Me too, and there aren't enough of them. Interesting! I sometimes layer Demeter Dirt and Tomato (which to me is all leaf, no fruit) so I wonder how Memory of Kindness would compare to that combo? I'll definitely try to check this one out! Hey, Robin…. I keep poking around on the website, trying to decide what to order. I'm thinking MoK, Mr. Hulot… is the Beach sufficiently unusual? What else do you think is interesting? Have you tried the Black March? (I think it sounds wonderful…) I'm not so interested in the single scents. Other recommendations? Thanks. I have not smelled Demeter Tomato, but if it is all leaf would guess the end result would be similar, although the dirt in MoK is subtle. You'll end up with something much longer lasting than Demeter, though! M, so sorry that I still haven't tried Black March. I can't keep up this spring: too many scents, too little time. But will try to do so this weekend. Yes, MoK & Mr Hulot, and Burning Leaves if the idea appeals to you. If you adore green, also CB93, and if you love tea, Russian Caravan tea (which is probably still my overall favorite from the line). The Beach thing really captures the coppertone perfectly, but since I don't love that smell, I prefer Mr Hulot. I am still making up my mind about the Tea/Rose, but have seen nice reports elsewhere so it is worth a try. M, am absolutely overwhelmed with samples myself at the moment. Can't keep up. Next time you get to NY, do go visit the shop…you'd be surprised at how much fun some of the individual accords are. Great place to spend a couple of hours sniffing. I have you to thank (blame?) for the trouble I got into today at Art With Flowers. As if I needed more stuff… I love that place, the closest I'll get to NY anytime soon. Thanks! Will be giving you props in an upcoming post. Ooooh, can't wait to hear what you bought!! thank you robin for the lovely review! very much appreciated here! unfortunately for me the scent did not wear well on my skin – the tomato leaf fled in short order and i was left with a dreadful pong reminiscent of cheap drugstore cologne. don't get me wrong – it's not a bad scent it just turns terribly wrong on me! people actually asked what i was wearing and not in a good way – so as much as i LOVED the tomato note i had to give up wearing it. that began my quest into perfume. when i began to make perfume on my own, my first mission was to capture that particular scent – my memory of tomato plants. that's what i'd hoped fresh water would be – unfortunately at the time my resources were extremely limited and i had to compromise on something that was good but not exactly what i wanted… well that's life – a constantly evolving process. CB, thanks so much for sharing the background of the fragrance! Demeter's Tomato was my first intro to the scent. I loved it and later found CB's earlier version of “Memory” which I'll probably finish this summer (oh boy, an excuse to go buy Memory!). Demeter's Tomato is still great, but of course, doesn't last long. I like keeping it in a desk drawer to perk up stuffy afternoons in the office. CB has another – “In The Kitchen” that is simlarly fresh and garden-ey. Might buy that too! I liked “In the Kitchen” too! And Black March, and Russian Caravan tea. It is a really great line.